Over the past few years I've added two Beatles biographies to my school library collection: The Beatles Were Fab by Kathleen Krull and Who Were the Beatles? by Geoff Edgers. 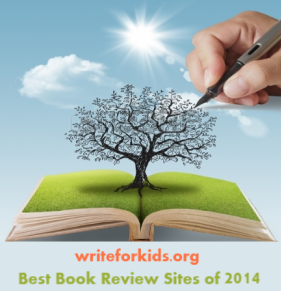 These books are very popular with readers in grades 3-5. Today a new biography of The Beatles hits shelves, and it's different than other books on the topic. This is a 32-page picture book aimed at K-2 readers. 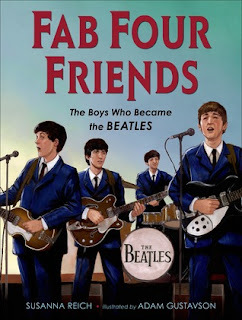 Author, Susanna Reich, focuses on the early lives of John, Paul, George and Ringo and how they came to form The Beatles. The narrative style story begins with John and describes his family life, his love of rock music and how his mother gave him his first guitar. The story then moves on to Paul's childhood and how music helped him cope with the death of his mother. After a section about George, Reich describes how the three met and formed The Beatles. The band performed in Germany and even recorded a few songs before Ringo joined the band. Quotes are interspersed throughout the story enhancing the narrative. The last section of the book is dedicated to Ringo's early life growing up in a rough part of Liverpool. "Their songs were irresistible and they were the best of friends. That friendship cast a spell across the globe. The Beatles' days in the spotlight had just begun." Reich includes a list of source notes and bibliography in the back matter. She explains in the Author's Note that her goal in writing the book was to "show how four ordinary boys growing up amid rubble of postwar Liverpool found music to be a powerful, even life-saving, force in their lives." Fab Four Friends is an excellent jumping off point for young music fans who are interested in learning about how four boys from Liverpool formed one of the most successful and influential bands in the world. Visit the publisher's site to view artwork from the book.